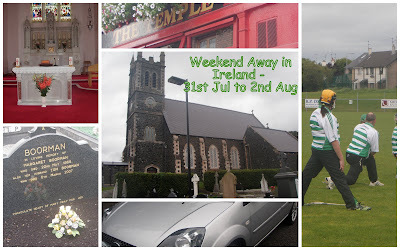 We spent a long weekend of the 31st July to 2nd August with Clint and Carmen's family in County Antrim, Ireland. Was lovely to catch up with everyone again and we were well looked after and spoiled. We got a hire car from Belfast airport on the Friday and drove to Antrim. Then on the Sunday when we were leaving returned the hire car and caught a bus to Dublin, where Carmen was going to begin her Paddy Wagon tour the next day. This gave us some extra time in Belfast at the beginning and Dublin at the end, which was nice.